The Victoria to Maui International Yacht Race, first contested in 1965, is the pinnacle of Pacific Northwest ocean racing. 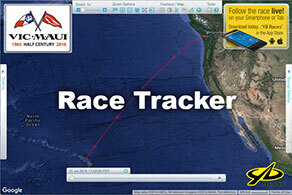 Vic-Maui runs every second year, starting in June or July off Victoria, British Columbia and finishing near Lahaina, Maui, a distance of approximately 2308 nautical miles. Vic-Maui challenges navigators to demonstrate their weather routing and navigational skills. Success depends on the navigator's skill in predicting where the Pacific High pressure zone and trade winds will be, nearly a week into the future. The adventure includes sailing around the Pacific High and surfing downwind in the trades. The days pass quickly with the fleet surrounded by dolphins and albatross, spectacular sunrises, sunsets and brilliant starlit nights. Teamwork gets the boats to the finish line near Lahaina, where each arriving boat is greeted with an outstanding Hawaiian welcoming party. Family and friends meet the racers to celebrate the accomplishment with hugs, leis and mai-tais. Many crew stay to spend more time enjoying Maui with their families before heading home. The Royal Vancouver Yacht Club is located at 3811 Point Grey Road on the south shore of English Bay on Vancouver's waterfront. Established in 1903 and renovated in 1978 and 1997, the club has 4400 members and is known as the "sailing capital of Western Canada". RVYC has a long history of hosting regattas and an international reputation for excellent race management and on-shore activities. The Royal Vancouver Yacht Club web site offers complete information about the club. In 1965, at the old Anchor Cove on Front St, a small group of sailors got to drinking & talking (as sailors will) and the Lahaina Yacht Club was born. Soon a fleet of sunfish were purchased and races were taking place off of the beach next to the Lahaina Broiler. In 1967 an all-volunteer group of LYC members took a building (an old laundry) that was tumbling into the ocean and built the clubhouse at 835 Front St. There have been several renovations over the years most of the work being done by members. LYC is host to two major events. Annually we hold the Lahaina Jackpot Fishing Tournament where we have had as many as 150 boats competing for more than $20,000. Bi-annually we host the finish of the Vic-Maui Race, known around the Pacific as having the best dock parties for each yacht that completes the race. Please visit the Lahaina Yacht Club web site for more information about the club. Vic-Maui is celebrating the Half Century mark in 2016. The first Vic-Maui was sailed in 1965. The race was a dream of Royal Vancouver Yacht Club member JG (Jim) Innes who at that time was a Captain for Canadian Pacific Airlines. Jim talked for years about the idea of such a race originating in Victoria and ending some 2308 nautical miles away in Maui. He convinced three other skippers to start with him off Brotchie Ledge in 1965. With Jim in his Lapworth 36' "Long Gone", there was Lol Killam of the Royal Vancouver Yacht Club with the 45' sloop "Velaris", Ron Ramsay of the Royal Victoria Yacht Club with the 45' ketch "Norena of White" and Boo Paskel from Seattle Yacht club with his 73' ketch "Tatoosh". The 1965 race and weather were typical; Westerlies in the Juan de Fuca Strait, a left turn down the coast to about the latitude of San Francisco followed by a right turn under the North Pacific High and a gybe with the northeasterly trade winds filling spinnakers for the sun run to Maui. Three boats finished the race some 15 days later at Kahalui Harbour on the north coast of Maui. The fourth boat "Tatoosh", having used the iron spinnaker, greeted the three arrivals with Mai Tai’s. During their stay in Maui they met up with the originators of what would become the Lahaina Yacht Club. Upon returning to BC waters both Jim and Lol proceeded to convince the Royal Vancouver Yacht Club and the newly organized Lahaina Yacht Club to jointly sponsor the Vic-Maui International Yacht Race. The second Vic-Maui was sailed in 1968 with some 14 boats entered. Bill Killam's Porpoise III swept the fleet first to finish and first on corrected time. She took 17 days, 6 hours and 50 minutes. The race, heralded as a FUN RACE has encouraged both the ardent racer and the cruiser-racer. It has been held every second year since 1968, with 2016 being the 26th Vic-Maui race. The number of entrants has ranged from as few as 4 to as many as 37 boats. The elapsed time record has been broken many times since 1965. The current record holder "Valkyrie", skippered by Gavin Brackett and sailing for the Royal Vancouver Yacht Club, completed the 2016 race in 8 days, 9 hours, 17 minutes and 50 seconds, crushing the previous record of 9 days, 2 hours, 8 minutes and 27 seconds which was set in 2000 by "Grand Illusion", skippered by James McDowell of the Lahaina Yacht Club. JG (Jim) Innes passed away on November 9, 2001 and Vic-Maui continues as part of his legacy.